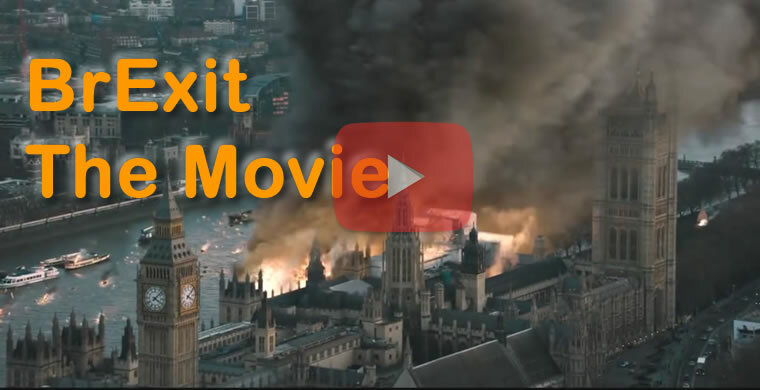 First UK BrExit then Trump, Next BrExit Tsunami Wave to Hit Italy HARD Sunday! The people of Britain voting for freedom from an emerging european super state on 23rd of June 2016 has ignited a fire in the people across the western world who had been increasingly been turned off by pass the parcel politics of the last 40 years, one of lying politicians that had long since detached themselves from the reality of the lives of ordinary people, where over time they came to believe their own lies, and so are primed to be repeatedly shocked by the impossible. BrExit was supposed to be impossible, Trump becoming President was supposed to be impossible and we don't need to look far to see that both were shock events that the establishment, politicians, pollsters, mainstream media, markets, and bookies never saw coming. For what happened in Britain that shocked the establishment ruling elite out of their complacency watch the following video of what happened on BrExit night that caught virtually ALL by surprise as illustrated by my selection of the highlights from 8 hours of BBC coverage of the EU Referendum result. So far TRUE BrExit is that which took place in Britain. Unfortunately for American freedom seekers the only choice they had on offer was between a delusional politician Hillary Clinton, who perceived being married to former President Bill Clinton implied that she had the right to occupy the White House for the next 4 years. As if she was the best America had to offer form a pool of over 300 million, talk about scraping the bottom of the barrel! Whilst on the other hand we had a reality TV star who equally delusionally lives in an even far more detached alternative reality bubble than Hillary Clinton, but 10 years of self promotion on prime time TV gave him the unique opportunity to ride the Brexit freedom wave into the White house, spouting a continuous stream of lies, making unachievable promises that the fact checkers gave up on trying to check. 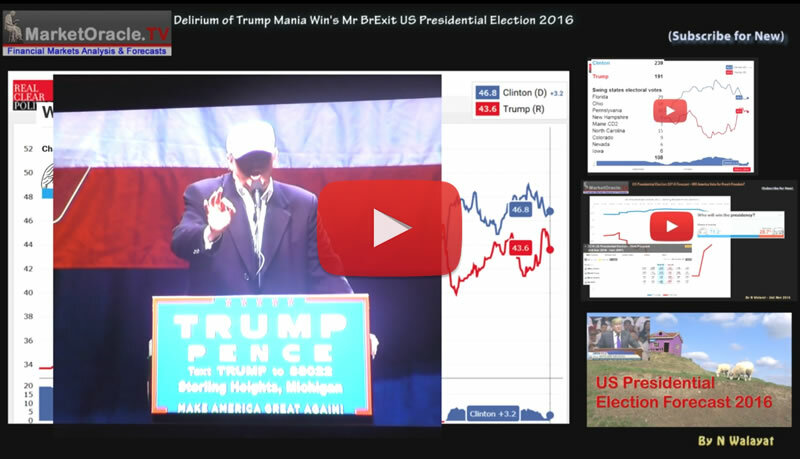 For how a Trump Presidency is likely to turn out then watch my slick production of March 2016. Firstly exactly what is the Italian referendum all about? A vote to amend the Italian constitution so as to reduce the number of senators and the power of the senate and thus concentrate power in the hands of the executive branch of government. So clearly it's not a referendum about EU membership or whether a rich alternative reality TV star should be put in charge of running the country. Rather Prime Minister Matteo Renzi wants to concentrate more power in his hands so that he can turn around an economy that has been in economic depression for over 8 years! What about the opinion polls? Apparently the opinion polls went into blackout mode on 18th November when they were typically giving the NO camp the lead on 53%. What about the betting markets? No betfair market but traditional bookies put NO on 1/3 and YES on 2-1. So at least for this vote the pollsters and the bookies are saying a Brexit outcome is more probable than not. What would Italy being hit by the Brexit wave actually mean? The only consequence I can see is that Matteo Renzi resigns and likely triggers an early Italian general election. Beyond that everything is rather foggy, but an general election would open the door to the populist 5 Star movement. So whilst a BrExit style anti-establishment result looks likely in Italy, however it does not result in anything like Brexit as it happened in the UK as it has nothing to do with membership of the european union. The key point is this, a NO vote is a win for the anti-establishment vote which will spook the markets for it is a harbinger of worse to come i.e. demands for more powers being pulled back from Brussels. So the referendum is more like firing the starting gun for an eventual UK style BrExit referendum. So creates political, market and economic instability in Italy that could likely culminate in credit crisis event, i.e. somewhere along the path of where Greece and Cypress found themselves triggering loss of sovereignty to Germany. The bottom line is that a NO result is the START of Italy's path towards a BrExit LEAVE the Euro-zone referendum vote probably several years down the road after much more financial and economic pain as its bankrupt banks teeter further on the brink of financial collapse as their bad loans mushroom to horrendous levels, some 40% of all of europe's bad debts are owed to Italian banks! At the end of the day Italy is just a bigger version of Greece i.e. we only need to look at Italy's 140% Debt to GDP, and thus is destined to follow a similar painful path towards a Euro-zone EXIT. Which means a run on Italian banks that is already underway is going to further intensify as euros continue to flood out of the country which WILL trigger a costly Italian banking sector bailout. Also an Italian NO vote will embolden anti-establishment movements in other EU states such as France, Netherlands and Germany. So the next real big Brexit elephant in the eurozone room is France which I will take a closer look at in a separate article.